Recently I went on a break from the blog whilst I was moving house. During this time, I missed my June Birchbox review. However, I did receive it, and inside there were a couple of things that I wanted to talk about. One of those items is the Balance Me Super Moisturising Body Wash.
Balance Me's Super Moisturising Body Wash is an award-winning, sulphate free, 99% natural body wash that helps to replenish, cleanse and protect dry and/or irritated skin. It is rich in shea butter, patchouli, benzoin oil and yarrow to keep skin so soft that you can skip on moisturiser afterwards if you're in a rush. 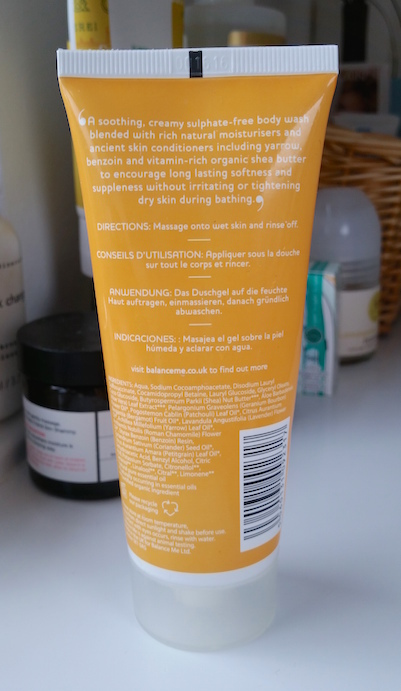 It comes packaged in a bright yellow squeezy bottle that holds 200ml of product (the one that I have from Birchbox is half the size) with a translucent screw cap. The product itself is a clear but golden tinted gel. It has a strong scent that primarily smells of the benzoin and patchouli oil to my nose. Apply to wet skin, massage and rinse! It lathers up really well, so you don't need to use lots at a time. Balance Me's Super Moisturising Body Wash is super moisturising and non-irritating, making it perfect for those with dry or sensitive skin. Dry, irritated areas are far better when this wash has been used. I did try to skip out on the moisturiser and I have to say that it did do a great job at keeping the skin hydrated. However, the skin is obviously more hydrated with the use of a moisturiser afterwards, so I wouldn't miss out on it every day. The smell of this wash is incredibly relaxing. 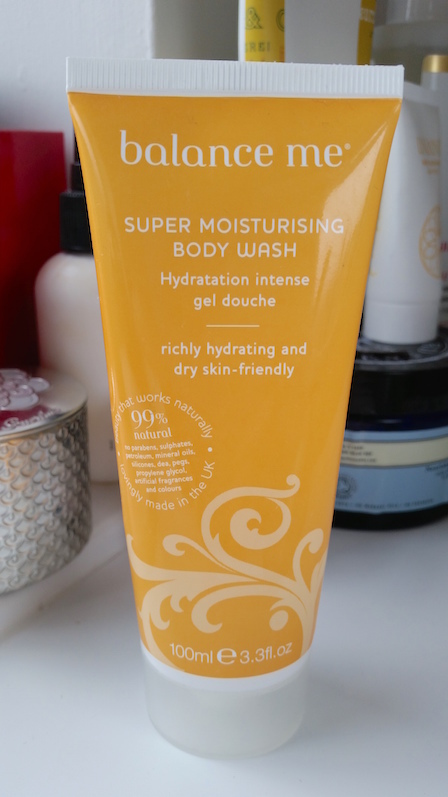 If you wash in the morning and you are one of those people who prefers a zingy and refreshing body wash to help to wake you up, you may find that this has the opposite effect. It's just so calming! This may just be a personal thing though, so don't let that be a deal breaker. Balance Me's Super Moisturising Body Wash is one of those products that is a real treat to use. It feels really luxurious and because it's natural it doesn't contain any harsh chemicals or fragrances. Overall, I do highly recommend this body wash, especially for the colder months when skin can get drier more easily. Not only that, but that calming, warm scent is just divine and perfect for the cooler days! The best part though? It's a total steal. It's £9 for 200ml, but I would gladly pay more as I feel that it is more than worth it. You can purchase Balance Me's Super Moisturising Body Wash for £9/200ml from Birchbox. What are your thoughts on the Balance Me Super Moisturising Body Wash? What's your favourite moisturising wash?